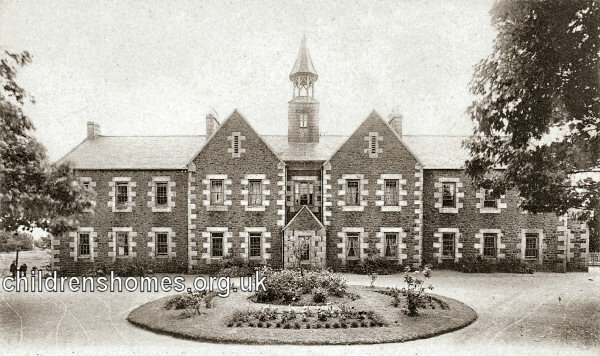 In 1867, the Jersey Industrial School was opened in purpose-built premises, near Gorey, in the parish of St Martin. It received up to 45 boys "of the lower classes of society and neglected children", who would have previously been accommodated at the workhouse-like General Hospital in Saint Helier. The institution was not part of the system of Certified Industrial Schools that operated in Great Britain and Ireland, but was similar in character. A home for girls had been opened in 1862. Jersey Boys' Home, early 1900s. By the early 1900s, the institution was known as the Jersey Home for Boys. In 1921, the Home was taken over by the States of Jersey, the Island's governing body. During the Island's German occupation during the Second World War, part of the building may have been used as a signal station, but clear documentary evidence about this appears to be lacking. After the war, the site continued in use as a boys' home, now run by the States' Education Committee. In 1959, following a decision to closed the Jersey Female Orphans Home, the boys' home was remodelled to accommodate up to 35 boys and 10 girls, together with facilities for a small number of infants below the age of two, and short-term accommodation for boys and girls on remand. At the same time, three Family Group Homes were established, each housing up to eight children. The revamped home became known as Four Winds 22nd September 1959, altered to Granville on 5th October 1959, changed again to Haut de Mallet on 19th February 1960; and finally settled as Haut de la Garenne on 9th March 1960. Haut de la Garenne continued in operation until January 1987. The building was then taken over by the Public Works Committee. In more recent times, the former home's premises have been used as a hostel and activity centre. In 2004, during the refurbishment of the building, workmen discovered a trapdoor leading down to an underground chamber in which shackles were found. A police investigation finally got under way in 2006, and was accelerated by the public revelations of two sisters, Karen Coote and Cathy Le Monnier, of their sexual abuse at Haute de la Garenne during the 1970s. At the end of the inquiry in 2011, Morag Jordan and her husband Anthony, who had been house-parents at Haut de la Garenne, were jailed for a series of assaults on children at the home over a period of more than 10 years in the 1970s and 80s. A number of other former staff were convicted of sexual offences at the home during the same period. On 6th December 2010, the Island's Chief Minister made a formal apology to all those who suffered abuse in the States' residential care system, acknowledging that the care system had failed some children in a serious way. At the end of 2013, the The Independent Jersey Care Inquiry began work to investigate a number of 'unresolved issues' in relation to historical abuse in the Island. Jersey Archive, Clarence Road, St Helier, Jersey. Has records 1867-1984.